"Did you get a makeover… or something?" 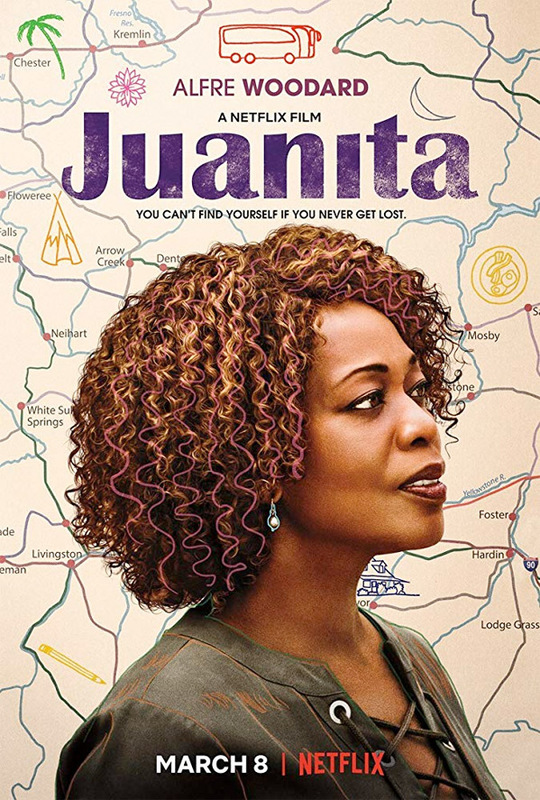 Netflix has debuted an official trailer for an indie comedy titled Juanita, from actor / director Clark Johnson. This hasn't shown at any film festival, but they're releasing it straight to Netflix early next month. Fed up with her life, Juanita leaves her grown kids behind and hits the road headed towards Montana in search of a fresh start. Alfre Woodard (from "Memphis Beat", "Empire", "Luke Cage", who also stars in Clemency from Sundance) stars as Juanita, with a full cast including Adam Beach, Gil Birmingham, Ashlie Atkinson, Marcus Henderson, & Blair Underwood. Doesn't look that great, but it does look like a fairly amusing reinvention film mixing things up. Might be worth a watch? Fed up with her deadbeat grown kids and marginal urban existence, Juanita (Alfre Woodard) takes a Greyhound bus up to Paper Moon, Montana where she reinvents herself and finds her mojo. Juanita is directed by American actor-filmmaker Clark Johnson, director of the movies S.W.A.T. and The Sentinel previously, in addition to all of his acting work. The screenplay is written by Roderick M. Spencer, based on the book by Sheila Williams. This hasn't premiered at any film festivals or elsewhere yet. Netflix will release Johnson's Juanita streaming exclusively starting on March 8th coming up next month. Who's interested?